This short film is based on a true story of a group of kids that started a soccer team on a floating village without an inch of soil. Nothing like a good old adventure film to make you feel nice. Definitely take a moment to read this important life lesson that a teacher taught his students! The teacher filled up a jar with golf balls until he could fit any more. He asked the students if they agree that the jar is full. They agreed that the jar was indeed full. The teacher then picked up a box of small pebbles and poured them into the jar with the golf balls. The pebbles filled all of the openings in between the golf balls. He asked the students if the jar was full. Once again, they agreed. Now the teacher picked up a bag of sand and poured it into the mason jar. The sand filled in all of the empty space left between the golf balls and pebbles. He asked the class again if the jar was full. The students agreed. Then the teacher pulled out two beers from under his desk and poured them into the jar filling the empty space between the sand. Before the students left, one shouted out. "You never mentioned what the beer represents!" The teacher smiled and said, "The beer just shows you that no matter how full your life may seem, there's always room to have a beer with a friend." The fascinating story behind the cover. Ashley Fiolek is a deaf motox champion who wins races by feeling the vibrations on the bike. Pretty incredible! Everyday I wake up early and dedicate the first hour of the day to inspiration, discovery and creativity. I allow the unpredictable pull of my imagination to take me wherever it pleases. I often end up developing some far-fetched ideas, or as google’s founder Larry Page calls them “moon shots”. My mind naturally steers in this direction because I believe the world is full of possibilities and moon shots are within reach. A couple years ago I woke up feeling an urge to create something unlike anything else, something that would inspire like-minded adventurers. Not knowing quite what it was or where to start, I decided that everything would fall together after thinking of the perfect name. After thinking up several terrible names like “Pretty Much Amazing” and “Goosebumps”, I thought of the name “Live Unbound”. I started by drawing a little picture to represent what the word meant to me (see below). Then I began writing what later became the LiveUnbound Manifesto and decided to create a series of videos to illustrate it. For me this was a moon shot because I was never a good writer, I had no funding and little time to devote to creative ventures. 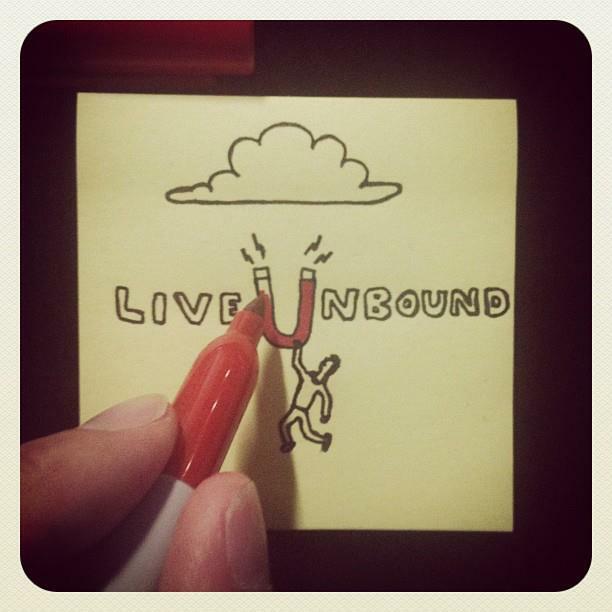 Two years later the LiveUnbound message has reached millions of people and has given me the chance to live my dream. The dream of making a living through my creativity, traveling the world and creating positive impact. Extraordinary things happen when you give yourself the opportunity to live in accordance with the boundless nature of our existence.